1 of 3 Bring a large pot of lightly salted water to a boil. Cook campanelle 10 minutes or according to package directions. Drain; set aside. 2 of 3 Melt 3 tbsp of the butter in a large saute pan over medium-high heat. Add mushrooms and shallot, stirring occasionally; cook 10 to 12 minutes until most of the liquid is absorbed. Add kale, stirring until wilted and slightly tender, about 3 minutes. 3 of 3 Meanwhile, in drained pot, melt remaining 3 tbsp butter over medium heat. Add flour; cook 2 minutes. Pour in milk in a thin stream, whisking constantly. Bring to a simmer and cook 7 minutes, until thickened, whisking occasionally. Stir in salt, pepper and nutmeg. 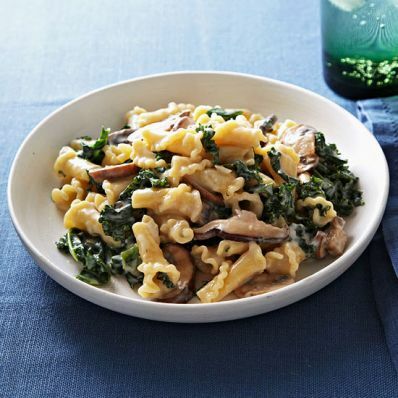 Stir mushroom-kale mixture and pasta into sauce and serve.